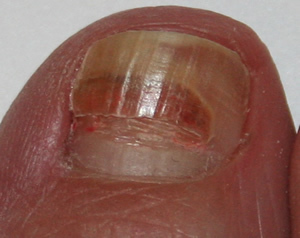 If a toenail suffers trauma, blood and fluid can build up underneath and a blue/brown/black mark (bruise) can appear. The mark gradually grows up with the nail. Occasionally as in the photo above a new toenail starts to grow. Trauma from repetitive activities such as hiking (especially long periods of downhill walking) and running. Any accidental injury such as dropping something on your foot or stubbing your foot against a hard surface. Wearing shoes that are too tight, too short or which don't fit properly. Generally no treatment is required for a bruised toenail, only time and patience for the bruise to grow out. However if the bruise is severe a small drain hole can be drilled to drain some of the fluid away and relieve the pressure. 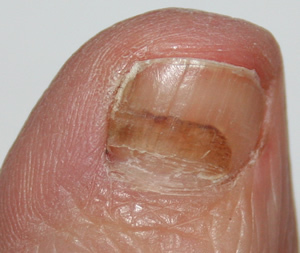 In extreme cases the removal of the toenail with local anaesthetic is the only option. A new toenail will eventually grow.